﻿ How are tailings disposed of? Location: Home » SOLUTIONS » How are tailings disposed of? How are tailings disposed of? Tailings dry discharge is a new tailings disposal process that has gradually emerged in recent years. It refers to the tailings slurry outputted by the beneficiation process concentrated in multiple stages, and then treated by high-efficiency dewatering equipment such as dewatering screen to form slag with small water content, easy precipitation and solidification. The slag can be transported to a fixed location for dry storage. 1. The tailings slurry is all discharged into thickener, resulting in a very high load on the thickener. So the thickener with a large diameter is required, along with this, is the large occupied area and high investment cost. 2. The large area, serious damage to environment, and large safety hazards of tailings pond resulting in difficulties in site selection, long tailings transportation distance, huge capital investment and high operating costs. 3. The low recovery rate, about 70%-75%, long return water pipeline, large capital investment, and large power consumption, resulting in high return water utilization costs. The system is mainly composed of tailings dewatering system, thickener, clear water tank, mud dewatering system, filter press, conveyor belt and dry tailings yard. The tailings dewatering syste first used to dewater tailings to reduce the subsequent thickener load before the tailings enter thickener. 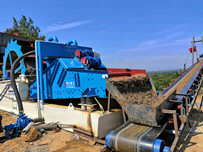 The tailings dewatering system has a small external size and is easy to arrange on site. 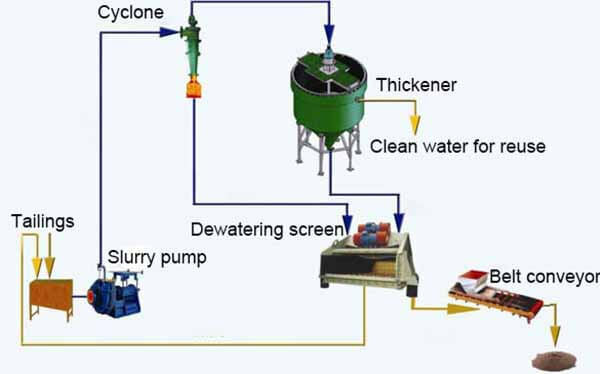 Tailings dewatering system consists of: dewatering screen + high efficiency concentration cyclone unit + slurry pump. 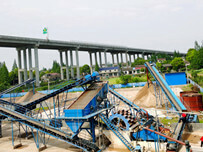 Dewatering screen is the main dewatering equipment. 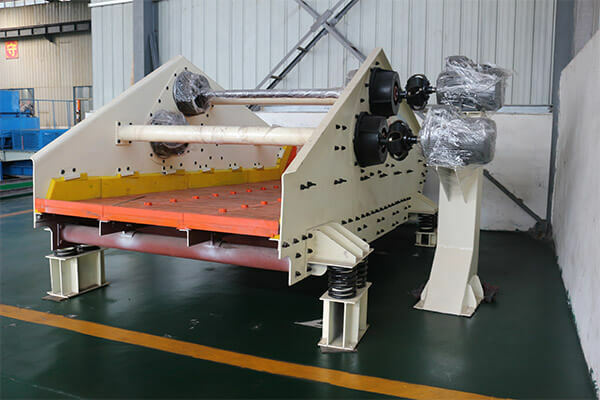 It is a linear vibrating screen with low inclination angle, and combined with generation vibrating force, so the water is discharged from the screen. The water content of finished products processed it is 12%-15%. The cyclone group is a concentration device before the tailings are screened. 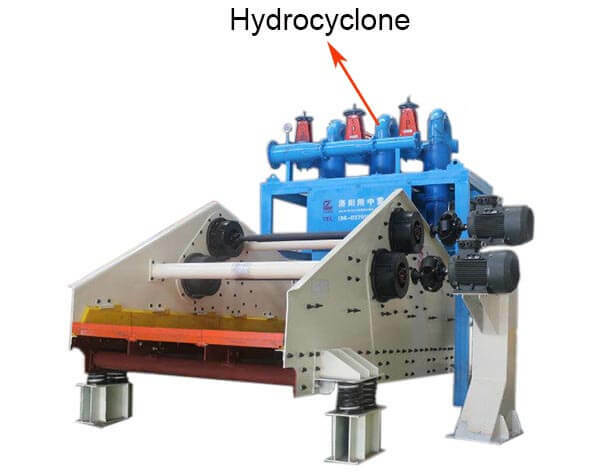 The concentration of the underflow of cyclone can reach more than 65%, reducing the burden of the dewatering screen and ensuring a good dewatering effect. It is an indispensable part of the dewatering system and can also reduce the investment in other concentrating equipment. 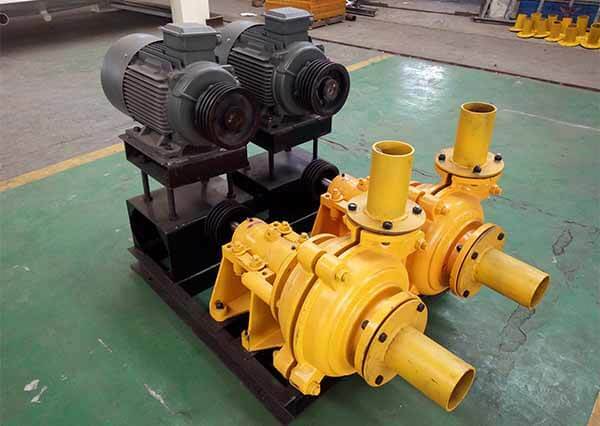 The slurry pump is a tailings pulp slurry conveying device. The slurry is transported from the tailings pump tank to the cyclone, and is equipped with frequency conversion control, so that the cyclone group can achieve a better working state. 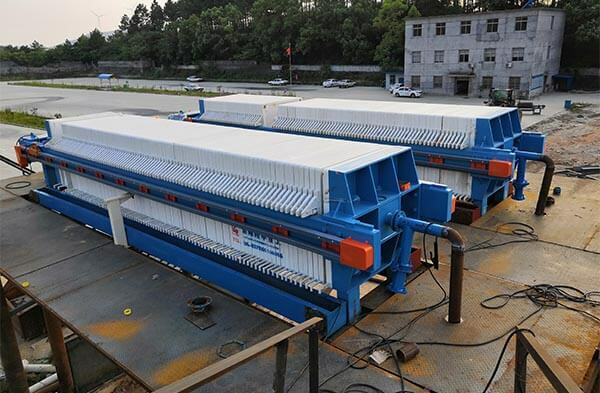 The tailings dewatering system can process 70%~80% of tailings, and the tailings moisture content is 15%~20%. The remaining 20% of the tailings enter the thickener with the cyclone overflow water for dense treatment. The cyclone overflow water containing tailings accounts for about 20% of the total tailings, and the tailings concentration is about 3.5%~5.0%. The particles are finer and the viscosity is larger. The grain size composition of 325 mesh accounts for 35%~40%, 200 The target is about 45%, which is more difficult to handle. Generally, a high-efficiency deep cone thickener is selected, and a flocculating agent is added to improve the precipitation effect. 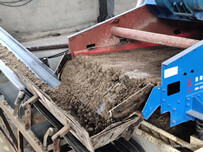 The bottom flow of thickener is treated by the next stage mud dewatering system or filter press; the solid content of thickener is controlled at about 100~150 mg/L, and the effluent quality meets the requirements of mineral processing, all recovered to the clear water tank, used as mineral processing water. . 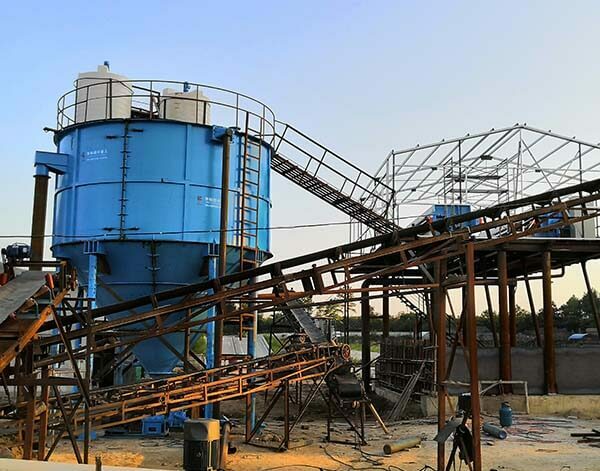 Since a large number of tailings have been processed through the tailings dewatering system, the load on the filter press is greatly reduced, so only a small filter press can be selected to meet the production requirements. The filtrate of filter press is recovered to the water recovery tank, and the filter cake (water content 10%~20%) is transported to the yard for treatment. Dry tailings can be stacked on the ground that is close to the selection plant. 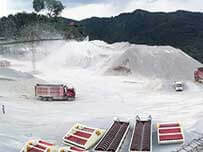 Dry tailings can be transported by belt conveyor to save investment and operating costs. In the tailings dry discharge system with dewatering screen as the main dewatering equipment, all tailings (except for a small amount of overflow with thickener to return water to use clear water pool) to achieve dry discharge, the return water utilization rate can be increased to more than 95%.